The average wait time for a patient wanting to get an appointment with his or her family physician has dipped slightly from two years ago, a new study says. But patients are still having to wait two weeks or longer. Health care consulting firm Merritt Hawkins, in a new report(www.merritthawkins.com), says its survey of family physician offices in 15 U.S. metropolitan areas found an average appointment wait time of 19.5 days in 2013. By comparison, average appointment wait time was 20.3 days in 2009. However, the researchers noted that average wait times equaled or exceeded 14 days in 10 of the 15 markets last year. In 2009, only eight markets equaled or exceeded the two-week mark. The company surveyed almost 1,400 offices across the 15 metro areas in family medicine and four other specialties. Researchers considered family medicine essentially flat. Cardiologists (16.8 days) and dermatologists (28.8 days) saw their wait times increase while obstetricians/gynecologists (17.3 days) and orthopedists (9.9 days) saw a decrease. Overall, the average wait time to see a physician across all specialties and markets decreased from 20.4 days in 2009 to 18.5 days in 2013. Despite the decline, Merritt Hawkins warned that physicians unable to see patients within 14 days are likely busy and need the help of other physicians or advanced practitioners to handle the overflow. The survey also found that the overall average acceptance of Medicaid patients has declined in the 15 markets over the past four years, falling to 45.7 percent in 2013, compared with 55.4 percent in 2009. An average of 76 percent of practices in the 15 markets accepted Medicare in 2013. Merritt Hawkins didn't survey for Medicare in its 2009 survey. 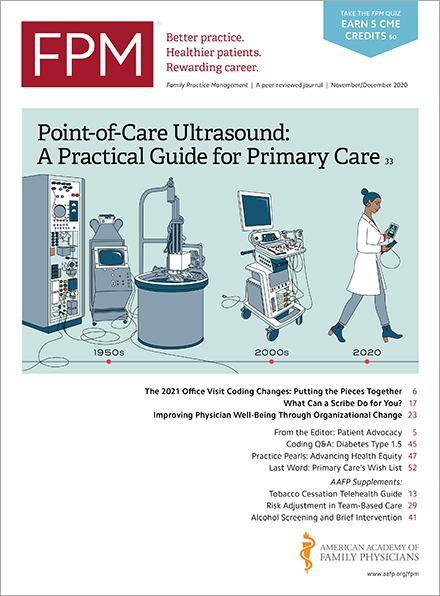 If you're looking for ways to get more patients into your practice faster, you can check out articles in Family Practice Management's Access to Care topic collection.